Google has evolved into an entity that is much more than just a search engine - though that function is certainly powerful enough in its own right! It has also developed a comprehensive range of business features with which professionals can increase their online visibility, establish credibility, attract clients/customers, and, ultimately, increase their profitability. 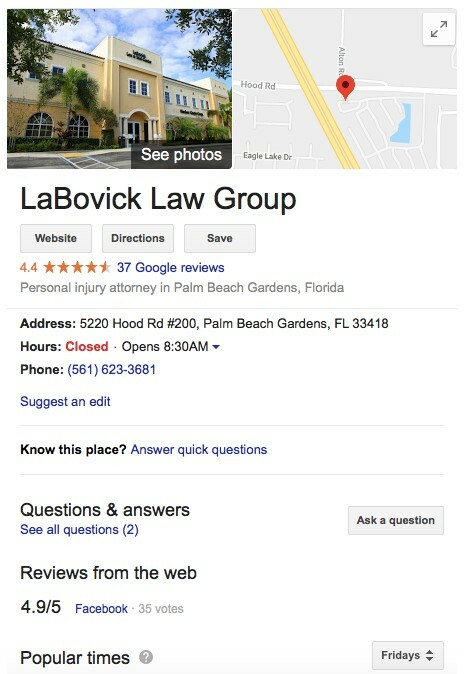 When it comes to SEO for law firms, Google My Business is a potent tool that you can leverage to meet your firm’s overarching goals. Why is it so critical? 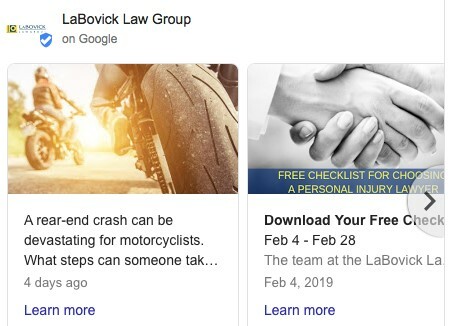 This is a free tool for businesses - including law firms - to manage their online presence across the vast Google universe, from Search to Maps. When you verify and edit your firm’s information, you enhance your SEO efforts and guide clients to you. This appears on the right side of the searcher’s screen. It gives them at-a-glance access to vital information, such as your name, address, phone, and hours. As you can see, there are also photos, a map, questions and answers, and both Google and Facebook reviews. Social proof is key when trying to generate leads and convert them into clients. It is also important that searchers have the ability to ask questions or post reactions in terms of SEO for law firms and client satisfaction. Post Content. 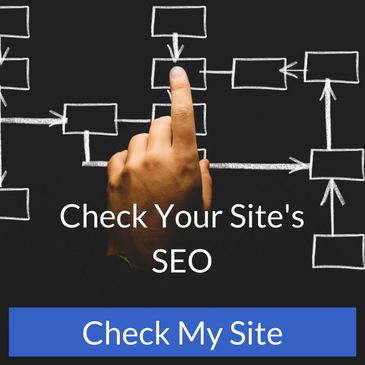 Original, high quality content helps establish you as an authority in your space, and you can link to fresh blog posts, articles, checklists, guides, etc., via Google My Business. This content delivers value to searchers, and they can easily click through and land on your website to learn more. Understand Your Online Presence. Google My Business provides insights into how clients searched for your firm. Where are they coming from? How many people called directly using the phone number on your local search results? You can also expand your presence by using AdWords campaigns to target your audience and increase visibility. Be sure to verify your firm with Google My Business and update the information regularly. If something changes (e.g., your business hours or your phone number), you want to answer a frequently asked question, or you would like to add photos (great for conversion!) or new content, head to your account and make the updates. As a lawyer, SEO services delivered by experienced professionals can help you stay on top of the search game, leverage all of the tools at your disposal, and save you time so you can focus on what matters: serving your clients. Contact THAT Agency today about our lawyer SEO services.